Update - August 1, 2013 - Troy Laufenberg is wanted for questioning in a shaken baby incidence (in addition to various drug charges) to 18-month-old Myah Larson. The baby suffered severe brain damage. It has been reported by KCRG-TV that the family has taken the child off life support Tuesday. The baby was found unresponsive at her mother's home at 1031/2 E. Center Street in Monona on July 15th. Laufenberg is the mother's boyfriend. 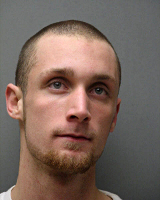 Monona, IOWA --- Several arrest warrants have been issued for Troy Alan Laufenberg of Monona, Iowa. Laufenberg’s whereabouts however are unknown at this time. If you can assist officers in locating Laufenberg, please contact DCI Special Agent Mike Krapfl, 563-599-4239. When apprehended Laufenberg will be charged with Child Endangerment (Class D Felony), Possession with Intent to Deliver (Class D Felony), Possession of a Controlled Substance (Serious Misdemeanor), and Possession of Drug Paraphernalia (Simple Misdemeanor). These charges are a result of the collection and analysis of evidence seized during the execution of a search warrant on July 19, 2013 at the home of Troy Laufenberg and Emily Voshell. The pair lived at 103½ E. Center Street in Monona, Iowa. Officers were initially called to the residence on July 15 on report of an injured child. That child remains hospitalized. The Iowa Division of Criminal Investigation, Clayton County Sheriff’s Office, and Monona Police Department are investigating.